under the small umbrella: Hall Pass Revoked? If you like The Farrelly Brothers films then you will probably like this one. Hopefully it will be more Something About Mary than Me, Myself & Irene (they acknowledge this as their worst film) but you can never rarely tell from a trailer how good / bad a film actually is. Warner Bros has released the poster, some images and a trailer (see below) from the film so you can make up your own mind. Best buds Rick and Fred (Owen Wilson and Jason Sudeikis) have both been married for many years. When they begin to show signs of restlessness at home, their wives (Jenna Fischer and Christina Applegate) take a bold approach to revitalize their marriages: they grant the guys a “hall pass,” one week of freedom to do whatever they want. No questions asked. At first, it sounds like a dream come true for Rick and Fred, but they quickly discover that their expectations of the single life—and themselves—are completely and hilariously out of sync with reality. 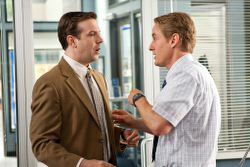 “Hall Pass,” a new comedy from the Farrelly brothers (“There’s Something About Mary,” “Dumb and Dumber”), stars Owen Wilson (“Wedding Crashers,” “Marley & Me”) as Rick, and Jason Sudeikis (“What Happens in Vegas,” “Going the Distance”) as Fred. Jenna Fischer (TV’s “The Office”) stars as Rick’s wife, Maggie; Richard Jenkins (“Step Brothers”) as the guys’ old friend, perpetual bachelor Coakley; and Christina Applegate (“Going the Distance,” TV’s “Samantha Who?”) as Fred’s wife, Grace. 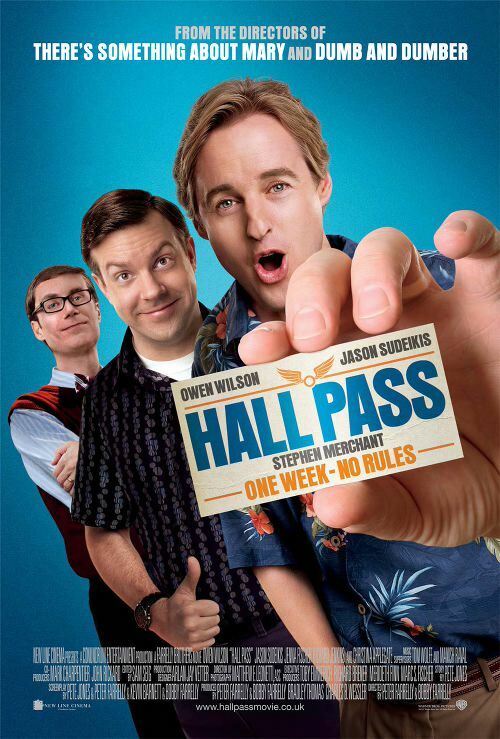 “Hall Pass” is directed and produced by Peter Farrelly & Bobby Farrelly, from a screenplay by Pete Jones & Peter Farrelly & Kevin Barnett & Bobby Farrelly, story by Pete Jones. Re-teaming with the Farrellys are producer Bradley Thomas and executive producer Marc S. Fischer, who collaborated with the Farrellys on their hit comedies “There’s Something About Mary” and “Shallow Hall.” Also serving as executive producers are Toby Emmerich, Richard Brener and Merideth Finn, with co-producers Mark Charpentier and John Rickard. © 2011 Warner Bros Entertainment All Rights Reserved.